A New Mac Tip Every Day: The standard sidebar of the Finder! 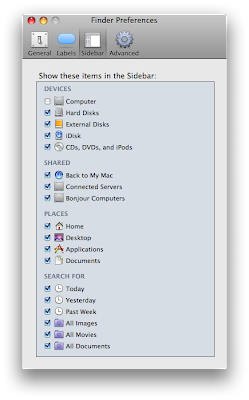 The standard sidebar of the Finder! The new sidebar that is part of the Finder in Leopard is entirely customizable, but what if you removed some of the defaults and you want to get them back. You could just drag them back, but there is an easier way. In the Finder preferences that I mentioned yesterday, you can check or uncheck the defaults of the sidebar in the "Sidebar" tab. It also lets you choose whether you want computers on your local network or on Back to my Mac to appear in the sidebar. When you select open a file from an application like Safari you get an extra item in the sidebar called Media which include photos, music, movies depending on the application...does anyone know if its possible to add it to the regular finder? hey, I have another great tip! When you are in Mail (don't know if this works with other applications) Holding down the Command (Apple) key while clicking a link will open up the link behind Mail. It saves me a ton of time! I just open up all my links from my RSS feeds in tabs and then go and read them later. The warning when emptying the trash!